Haunted Towers Pictures has released the brand new poster for its newest movie project, Nilalang. The company posted the poster on its official Facebook page. 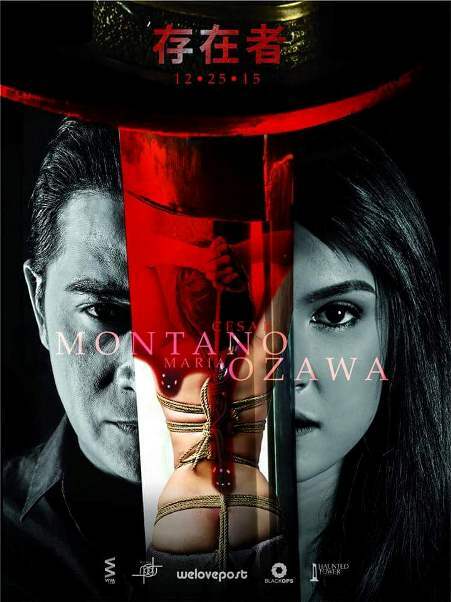 The official poster features a bloodied samurai sword in the foreground and the movie's main cast members - Cesar Montano and Maria Ozawa - in the background. It can be recalled that Haunted Towers Pictures released an initial poster for the film back in July when Robin Padilla was still considered to star in the movie. Padilla had to back out of the project so that he can take care of his then-pregnant wife, Mariel Rodriguez. Montano stepped up to the plate to replace Padilla. Directed by Pedring Lopez, Nilalang features a plot which tackles stories about corrupt cops in the Philippines and their connections with Japan's mos notorious gang, the Yakuza. Also starring in the film are Meg Imperial, Roxanne Barcelo, Yam Concepcion, and Troy Montero. Nilalang is part of the upcoming Metro Manila Film Festival which is scheduled to run from December 25 to January 7, 2016. It will be competing against eight other official entries - Beauty and the Bestie, Buy Now Die Later, Haunted Mansion, Hermano Pule: Ang Hapis at Himagsik ni Apolinario Dela Cruz, All You Need Is Pag-ibig, My Bebe Love: Kilig Pa More, Walang Forever, and Conman: Honor Thy Father. Image credit: Haunted Tower Pictures via Facebook.